MERCED, Calif. — California is deficit-spending its water and has been for a century, according to state data analyzed recently by researchers from the University of California. UC Merced Professor Joshua Viers and postdoctoral researcher Ted Grantham, with UC Davis at the time, explored the state’s database of water-rights allocations, and found that allocations in California exceed the state's actual water supply by five times the average annual runoff and 100 times the actual surface-water supply for some river basins. In a good year, the state has about 70 million acre feet of surface water available for use. Based on active water rights records, a total of 370 million acre feet have been allocated. “We’re kind of in big trouble,” Viers said, considering the changing climate and the expectation that more frequent, multi-year droughts are the new normal. 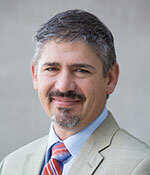 Viers, the director of The Center for Information Technology Research in the Interest of Society (CITRIS) at UC Merced, and Grantham, now a scientist with the United States Geological Survey, have had their analysis, entitled “100 years of California’s Water Rights System: Patterns, Trends and Uncertainty,” published in the journal Environmental Research Letters this week. In the midst of the extreme drought, Viers and Grantham advocate a major overhaul of policies and procedures. The water-rights allocation system is complicated and backlogged, which contributes to the problem, Viers said. For example, people can take water without an established right, apply retroactively for the right to use the water and continue taking the water – sometimes for up to a decade – while waiting for their applications to be reviewed. Appropriative water rights date back to before the Gold Rush and are given to users along rivers, called riparian rights, or prior-appropriation rights given to users in the order they begin using the water. One problem is that California’s Mediterranean climate means it’s almost impossible to be certain about how much water will be available in any given year, or from year to year. This year is particularly dry, but the winter could also bring unprecedented rains. Groundwater usage is not yet regulated and the state doesn’t have a unified water-monitoring system, so there’s no way to accurately tabulate available resources. Additionally, not all users are honest about how much they use, overestimating so they don’t lose as much if cutbacks are put in place. But all those allocations mean that in times of drought, it’s hard to tell who should have to reduce water extraction. Supported by CITRIS and the National Science Foundation, UC Merced Professor Roger Bales and colleagues have developed a sensor network that could be turned into a unified, statewide water-information system, but Bales estimates such a system would run about $100 million – a decision the state will have to budget for. In the meantime, the state is working with Viers and Grantham to sort out some of the issues in its database to get more information and make it available to those who make policy decisions.